Based on some of the comments I've been receiving on this blog entry, I think people are reading the first couple of sentences and not really taking in the rest. My faith collapses, but that doesn't mean it has been blown away. The rest of the first paragraph says that I recognize the flaws in my understanding that cause it to collapse. I'm just venting, just trying to pour out some of this terrible pain, just trying to find some relief. I don't have the small grace we usually have when we face devastating loss, which is the ability to go through the grieving process and find some small measure of peace. I know the loss still hurts, even after that. But my grief is arrested. I can't move on. I am stuck in what surely must be one of the many circles of hell. Today I have a day off work. I have some things to do, but the day is largely formless, so let me try to put some words down here. My difficulty in writing has been due to several things. One of them has been a simple crisis of faith, a collapsing of the little house of beliefs I have been sheltering in. And I'm afraid that has included my faith in the idea that you are likely to be still alive. I have come to recognize over the years that I am quick to put on blinders. There was a time I used to think it was not possible that you could still be alive because if you were I was positive you would have found some way to contact me. Then I came to realize that there are a hundred and one reasons why you may not have been able to contact me, even if you were still alive. Recently, I started writing these letters to you, and you know, I think I really expected you to answer. Every time I go to check the mail in my post office box I think, maybe there will be a letter from Michaela. But you have been silent. If you were there, I think that you would not be able to remain silent. Wherever you are, whatever you have been through, even if you chose not to save yourself, my heart cannot believe that you could see my grief and not be compelled to reach out and stop it. I know I could be wrong. I know this. What makes me think that if you are out there, that you have even read my blog? Maybe you haven't even heard of it. Amazingly, I run into people every day who don't even know who you are. Not everybody watches CNN, America's Most Wanted, Dateline NBC, or even the local news. Not everybody even watches Oprah or reads People magazine, apparently, because they don't know, they haven't heard. Perhaps you are among them. 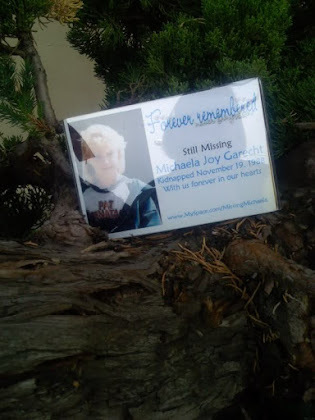 Perhaps what I need to do is finish writing my book, Missing Michaela, and try to get it on every shelf in every store, and then perhaps you will see it, and you will know that I am still looking for you. But I do also know that you might not be alive. And that's ... well, strikes me dumb. It is not the fact that I wouldn't see you again in this world, that I miss you, that takes away my words. It is the thought of you dying, the horrible and inconceivable thought that someone could have done that to you. There have been other things I have really wanted to write in this blog, more pleasant things. I want to tell you some of the things going on in your family, and I will, in little bits, while respecting the privacy of your brothers and sisters and the people who share their lives. Your youngest sister just turned sixteen yesterday. Of course, you have never met her. This last year has been a really good one in her life, and I hope the next one is even better. This is good for me, you know, part of what has always kept me going, the joy of your brothers and sisters in my life. But yesterday, on her birthday, I got up and made breakfast for her, and we had breakfast together before school. I also gave her her birthday present in the morning -- some boots she had been wanting -- because I thought she might want to wear them that day, and also because I can hardly wait to give presents. Then she went to school and I went to work. In the evening, she went out with her boyfriend and some friends. She checked with me, to make sure it was okay, and I told her it was. This was the first time she had spent her actual birthday with other people instead of me. What I had told her was, this is your day, and I want you to do what makes you happy. This is surely not the first time any of my kids has spent their birthdays away from me. Alex lives a few hundred miles away and I haven't seen him on his birthday for years. Libby often goes out with other people on her birthday. But Johnna is the baby, you know. It makes my heart overflow with happiness to see my children happy, and I know that in order for them to be happy they have got to cut the apron strings and go out and make their own lives. If they walk away from me, as long as they are walking in a good direction, I am very happy. But also I am sad. Letting go, especially of the last one, is sad. My life has been centered around being a mom for a very long time now. 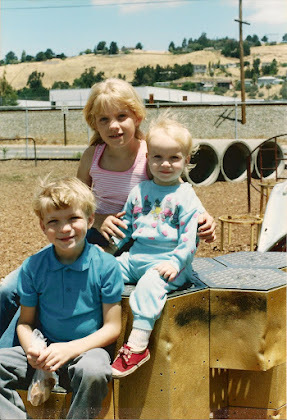 For almost 31 years, my children have been the center of my life, and I have been at least close to the center of theirs. Well, all this goes back to you, too. I gradually let go of your brothers and sisters. I watch them go off happily, watch other people take the place at the center of their lives, including their own children! But you. With you, there was no bittersweet letting go. You were ripped away from me. You were not becoming independent. You were a child, still enveloped in the need for me. You weren't walking away to pursue your dreams. You were dragged screaming into a nightmare. For me, perhaps letting go of your brothers and sisters contains a distant echo of that first time. Johnna should be happy that she is the youngest. She reaps the benefit of the training I received from her older siblings in these things, of the training of my heart. Michaela, one of the things I want to tell you is that there is something to come home to here. As much as my heart has been broken, the heart of our family has not been broken. There is still a place of joy here. There is still love, and it is all the stronger for knowing how precious it is, for knowing the price it can extract. Oh Sharon. I don't really know what to say. Your so obviously hurting right now. You were so excited when your first started writing these letters, its so upsetting to feel the pain your in. I always want to help people and I want to help you too, but I don't know how because the only thing you want I don't know how to give to you. I can help maybe by offering a few explanations-maybe michaela has never had internet access? Maybe she has it but its very limited. Maybe she doesnt know how to use it properly. I know that sounds crazy but I remember even though I started using the internet at the age of 14, I didn't know how to send an email until I was 17!! Nobody showed me, and believe it can be hard to work out how to do that on your own!! Remember I was using computers my entire school life yet because I had never been taught how to send an email I didn't even know how to set up an email address. As for search engines, I used to type in to a google search bar 'yahoo' and then use the yahoo search engine to search for the information I was looking for. This was because I didn't realise I could use google the same way as I used yahoo!! So you see we use the internet all the time now but think back to when you first started using it. Did someone teach you? Imagine trying to work out how to use the internet or even a computer with out someone showing you how. Imagine how intimidating that would be? Maybe there is no one to show Michaela. 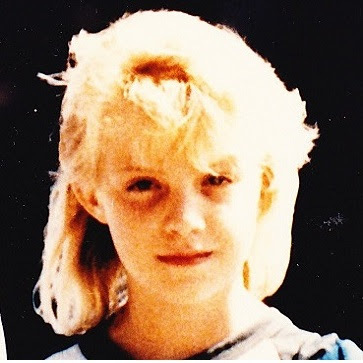 I'm not really sure, but I think Michaela wouldn't have had much experience with computers at the age of 9? Now lets imagine shes not used one since. Would really know where to start from with no one to show her? I know its hard to believe that someone would not know how to use a computer BUT I do know people like this. It is possible to live your life with out a computer. Well thats just a suggestion. She could have missed those tv shows. In my house the only channels that are ever on are, playhouse disney, mtv or star plus. Absoluteley no normal channels or news channels. Who knows? Hopefully you will know one day! Don't give up Sharon! Can imagine how great it will be for Michaela to read these letters one day even if she hasn't yet. Zara, don't worry about this. Is it possible to have faith without ever having doubt? For some maybe, but for me sometimes it's just too heavy a load to carry and I have to put it down for awhile. More to the point, is it possible for me to do ANYTHING about Michaela without it causing me pain? No, no, no, it isn't possible. Sometimes, honestly, I have to draw back, concentrate on the rest of my life and on my living children, just in order to keep from falling into a pit of grief I can't climb out of. I know there are many reasons why Michaela might not have seen my blog. I know you are young, Zara, but personal computers didn't even exist when Michaela was nine! None of us had used them! But most of us have learned how to since then. I do know plenty of people who are on the internet and who watch TV who have not heard of Michaela, and she could be one of them. Just wanted to let you know I was thinking of you and Michaela today and sending you Prayers good wishes and hugs. There could be so many reasons why Michaela might be alive, but not reading this blog. But I agree Sharon, if she were reading it, and if she remembered her life, she would have surely replied. I think the hardest thing for you is not knowing. 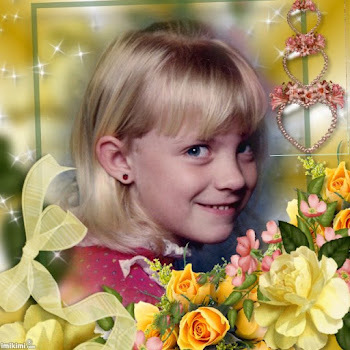 With Jaycee, she had been living so close and her mom had no idea. I wish there was someone who knew who would just come up and let you know. Even if Michaela herself does not reply, there must be someone with some knowledge, who will feel compelled by your love and anguish and come forward with information. 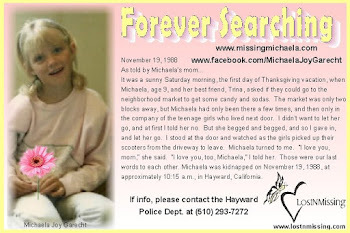 Seems silly, but I live in the bay area, and am always on the lookout for Michaela. - Abby. I have started a chain email sending the link to your blog to my friends and requesting them to pass it on. You and Michaela are in my prayers everyday. I pray for her to be found, for answers to your questions, for justice!! Please let us know in what other ways we can help. Most of the time when I read your blog here, I am speechless. All I want to do is help, but I know there isn't anything I can do but pray. So you are always in my prayers along with Michaela. Amen to what Kellee said. I've been checking back here as well and it worries me when too long passes without you writing. But do whatever it is that you need to do; just know a lot of us are praying and sending you love and always keeping our eyes open. Thank you all so much for your love and concern. I really appreciate it more than you could know. This is the first time I have seen or heard of your blog. They say the good thoughts that a person thinks for others are more powerful than the ones that she thinks for herself. I am so hoping and praying that good things will come in your search for Michaela. I too always want to read what you have to say. I hope that you know that you will always be in my heart and I always think and pray for you and Michaela too. I understand what you mean when there are just those times that you need to back off just because it is so painful. I am sure that everyone understands that and you do need to do what you should do and you need to cope with the pain the best way that works best for you. Just because you are not writing or even thinking about Michaela at times does not mean that you have stopped the love for her. Your mind and heart are just trying to recooperate..this is ok. The love you have will always be there and that is something that did not get stolen from you. I believe that the Love will go with us when we leave this Earth. It is the one thing that we take with us when we die. When things get rough just remember that we need to focus on the Love and not the Pain. I am sure that it is hard to separate this. I think that this is similar when Jesus was here on Earth. This was a painful place for him to be even before he was cruicified because we do not realize what he gave up to come here. 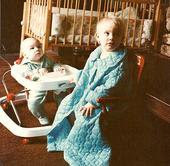 It is comparable to us turning ourselves into some type of rodent and having to live with the rodents for about 33 yrs. To leave Paradise for poverty. He also left all of the love behind in heaven. He left the most perfect place to come to the most imperfect place. I guess what I am trying to say which is what I always say is to turn your eyes towards him in order to see past the pain. He is the only medicine that can heal this type of pain and trust that he has done the same for Michaela, which I know that he had to have been there for her through whatever she has experienced. Just trust the love that he has for you and for her. I can't say that you will be ok I really can not but I do know that God can say it because he knows and he has probably also protected you all of these years without you ever realizing what he has exactly done but He is capable of it so that is why you have to just trust and obey. I know God and I know that he has loved you and Michaela through this entire process because he is GOD. My question is this...if she was to google your name, would that come up with anything? I did read that you have remarried, correct? My heart goes out to you. You do not need to explain yourself. Those who get it, get it. I can't imagine how painful this must be for you. I understand about the fact that you are kind of stuck. 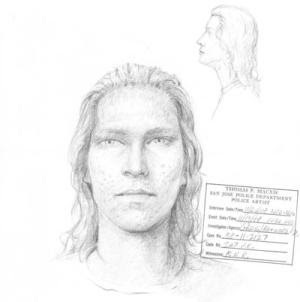 For what it's worth, I found this site through the FB page on missing people. I've added that page to my profile to help. I do hope that someday this is all resolved for you. i was following the story on jaycee duggard and saw you on the news. 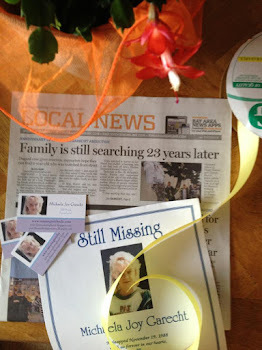 i was hoping for you at least to find closure of some sort..i think once she was found that gives alot of hope that ur daughter will be found..there is a show called the missing that i found the other day..stories of family members telling their stories mabey you can contact them..i wish you luck and you are in my thoughts! i had you on my myspace but not sure if you still use that..